With this last post of the year, I'll hit the rewind button on 2010 and recap the news and features that made their way to Gluten Free Philly over the past 12 months. I led off the year in January writing about the many gluten-free products from Schar, which recently announced that it would be building its first U.S. manufacturing facility in southern New Jersey. The Delaware Valley is fortunate to have many gluten-free bakeries close by, and I profiled two of them in January: Cookies...For Me? and Sweet Freedom Bakery. I also wrote about the return of gluten-free snacks to Starbucks, the removal of gluten from Nathan's hotdogs, and new Snikiddy snacks. For a short month, February was a busy one. I featured The Greenwood Kitchen, purveyor of "raw" snacks, and local pizza chain Seasons Pizza, which added gluten-free pies to many of its locations. Also that month, I broke the news that Whole Foods was discontinuing its branded line of gluten-free baking mixes; as if on cue, King Arthur Flour soon unveiled plans for its own line of gluten-free mixes. P.F. Chang's announced that it would be adding beef dishes to its already extensive gluten-free menu. I reviewed Stephen Starr's Asian restaurant Pod and announced plans for a local gluten-free dining event at Casona in Collingswood. New products mentioned were Glenny's fruit-and-nut bars, new flavors of Liz Lovely cookies, Glutino rice cereals, Annie's Homegrown cookies and deluxe mac-and-cheese, and Pamela's individual-size brownie and pancake mixes. March brought news of new brownie and pancake mixes from Simply Organic, Peeps-flavored Italian ice from Rita's, Blue Horizon crab cakes and fish sticks, Food for Life English muffins, Glutino multigrain bagels and yogurt- and chocolate-covered pretzels, and Passover products like fudge-stripe cookies. I also featured the locally-made quinoa burgers from Asherah's Gourmet. In addition to showers, in April came word that Snyder's would be introducing gluten-free pretzel sticks, Hain Celestial's Gluten Free Café line would include soups, gluten-free Bisquick and Hamburger Helper mixes from General Mills were on the way, and Pure Tacos would open an all-gluten-free taco stand on the Boardwalk in Ocean City. All of this was tempered by the news the area's original gluten-free bakery Mr. Ritts would be closing its doors. Featured this month were baked goods from The Grain Exchange in Doylestown, now available at many area markets. I also wrote about the snack-factory tours offered by Utz and Snyder's in York County and Herr's in Chester County and Udi's gluten-free bagels. May was a light month, but I did review the Snyder's pretzels and featured gluten-free bakery Tesori's in Medford, which has unfortunately since closed. I redesigned the Gluten Free Philly website in June and led off the month with a review of breads from Canyon Bakehouse and a mention of new soups based on recipes from longtime Philadelphia restaurant Old Original Bookbinder's. I also resumed my ongoing Road Trip series, writing about a Mother's Day weekend trip to New York City. Mid-month, I wrote about a newly imported gluten-free Spanish beer, Estrella Damm Daura lager, which has since rolled out more broadly in the United States. Later in the month came word that Food For All, an allergen-friendly market, would be opening in Philadelphia's Mt. Airy neighborhood. New products mentioned included Ian's animal crackers and Whole Foods cupcakes. In the midst of a run to the division title, the Phillies held their annual celiac awareness night in early July. Another Road Trip entry detailed a shore excursion to Ocean City. Main Line Baking Company rode into town at the Wynnewood train station, offering gluten-free treats. I started a occasional series called Dishing With, and my first interview was with celiac Monica Glass, the pastry chef at 10 Arts. I also passed along information on MI-DEL's new mini S'mores cookies, Goldbaum's waffle cones and Harry & David's cookies. News that Dock Street Brewing Company brought back its Sudan Grass Ale, made with sorghum, surely slaked the thirst of many patrons in the heat of August. Making their debut that month were Schar's cheese crackers, baguettes and hoagie rolls, burritos from Amy's Kitchen, Handy's crab cakes, Heartland pasta, and Immaculate Baking's chocolate-chip cookie dough. I reviewed Rx in West Philly, which hosted a dinner from the Philadelphia Gluten-Free Supper Club. 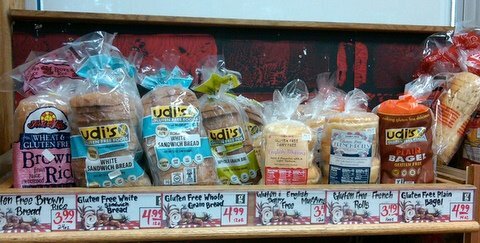 The spotlight shone in September on more new gluten-free breads, these ones made by Rudi's. I also profiled The Naked Cookie in Montgomery County and wrote about Ian's new chicken tenders and pepperoni french-bread pizza, Woodchuck's pumpkin-flavored hard cider and Hol-Grain's onion ring batter and tempura batter mixes.The another installment of the Road Trip series chronicled our summer vacation to Toronto, Niagara Falls and Cooperstown. The year's last Road Trip was posted in October, when I wrote about our day at Citi Field in New York to see the Phillies take on the Mets. Reviewed were products from gluten-free bakery O'Dough's and Philadelphia restaurant Adsum. Lots of new foods garnered a mention then, including Kinnikinnick pumpkin donuts, Purely Elizabeth cookie mixes, Coleman chicken nuggets, Glutino donuts and Ian's chocolate-covered wafer bites. In November, I posted my roundup of the NFCA's Appetite for Awareness, the largest gluten-free event in the area. New products figured in both features and News & Notes posts, including locally made Better Butter, Bachman pretzels and Ian's - yes, Ian's again - with onion rings on the way early next year. The many kinds of My Dad's Cookies, which I reviewed in December, prompted raves from readers. I also shared word that Philly's own Sweet Freedom Bakery would be appearing on Food Network's Cupcake Wars show. (The episode debuts tonight at 9 p.m. Eastern.) Perhaps the biggest product development this month was that gluten-free soft pretzels will soon be coming to Whole Foods freezers, courtesy of Kim & Scott's Gourmet Pretzels. Time doesn't permit me to list all of the new area restaurants that added gluten-free menus this year, but there were lots of them. My list of the accommodating restaurants was constantly updated, as was the catalog of local markets, caterers and bakeries. I can't be everywhere, and so I appreciate reader emails letting me know about new finds in the greater Philadelphia area. Don't be shy about dropping me a line or posting a comment. I'm also open to suggestions on how to improve the site and for topics to write about in the coming year. Thanks to everyone for tuning in, and have a happy and healthy 2011! I won't refer to punny headlines like "Merry Cliff-mas" and "Unbe-Lee-vable" (looks like I just did, didn't I? ), but with the Phillies' signing of Cliff Lee I am more impatient than ever for the start of the baseball season. As I mentioned last week, the Phillies will have another Celiac Awareness night in July, but I'm hopeful that on the strength of the strong turnout for the one this past season that more gluten-free options will be available all season long. I posted a DVR alert on Tuesday. The December 28th episode of the Food Network's "Cupcake Wars" will feature Philly's own gluten-free Sweet Freedom Bakery will be one of the combatants. Congratulations to reader Amy C., who was the winner of the recent holiday giveaway hosted by Gluten Free Philly and nine other gluten-free blogs. I hate to be the bearer of bad news, but word came on Monday that Ninety Nine Restaurants has closed its remaining Pennsylvania locations in Audubon, Bensalem and Warrington and its outlet in Deptford, New Jersey. The chain was an outlier in that it actually had gluten-free buns for its burgers. Elsewhere, reader Rich S. reports that Cafe Monterosso in Yardley, which offered gluten-free pizza, pasta and desserts, has closed. According to an outgoing phone message, the owner plans on relocating the restaurant. On a brighter note, Sonata in Northern Liberties has updated its gluten-free menu. Warminster's new BRE Bakery has picked up several varieties of My Dad's Cookies, which I reviewed last week. The bakery currently is carrying the Black & White, Raspberry Linzer, Chocolate Fancy, Chocolano and Italian Chocolate & Raspberry cookies. 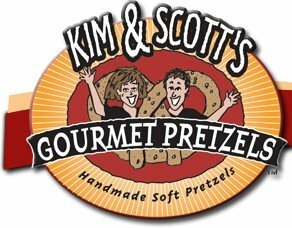 Since Philadelphia is, of course, the home of the soft pretzel, I'm thinking that the new gluten-free Bavarian Pretzels from Kim & Scott's Gourmet Pretzels just have to be sold in this area. The company announced this week that beginning in January the pretzels will debut at select Whole Foods stores, although information on ingredients and manufacturing protocols wasn't mentioned. Thanks to Gwinnett (Ga.) Gluten-Free Examiner Jennifer for the info. 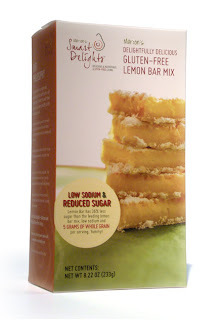 Here's another first-to-market gluten-free product: a lemon-bar baking mix. Introduced by Marion's Smart Delights, the new mix is not only certified gluten-free, but also allergen-free, Kosher certified and made with all-natural ingredients. The mix is not yet available in the Delaware Valley but can be purchased directly from the company for $6.49 per box. Made with gluten-free oats from Finland, instant apricot oatmeal is the first of several oatmeal products to be introduced by Simpli. The instant oatmeal is certified gluten-free and sells for $4.95 a box, which contains five servings. You can read about the company's harvesting and processing of its gluten-free oats at its website. 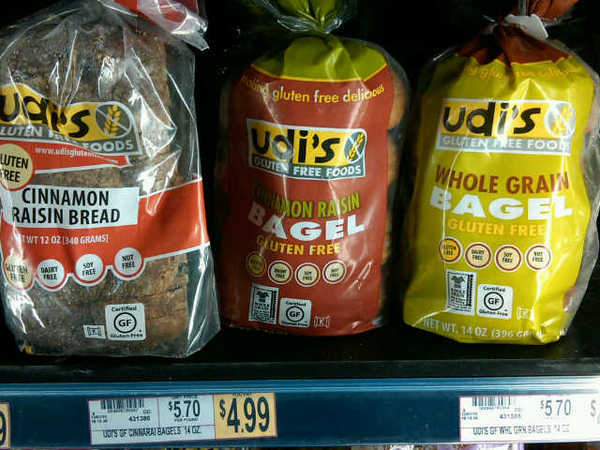 More Udi's goodness, spotted at Wegmans: cinnamon raisin bread and bagels and whole grain bagels. These new products will be more widely available in the new year. Fans of Snikkidy snacks can enter to win a product box from the company. Just fill out the form here between now and January 15, 2011 and write in Gluten Free Philly as the referring source. Two entrants will be randomly selected to win, and the blog that refers the most readers will receive snacks to award to a lucky reader. Also, 25 readers from the winning blog will receive a Snikiddy Snack Pack box, which will include three snack packs and a coupon. Our older son, who turned 10 this week, is a big fan of the Food Network and probably knows more about cooking and baking than me and my wife combined. 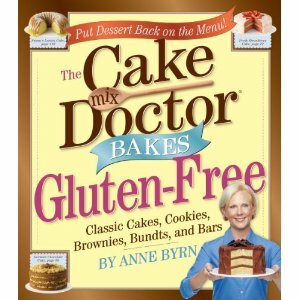 Among the birthday presents we got him was a brand-new gluten-free dessert cookbook called The Cake Mix Doctor Bakes Gluten-Free by Anne Byrn. The book contains 76 recipes, from Caramel Melted Ice Cream Cake to Southern Sweet Potato Pound Cake. 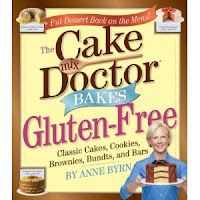 The cool part is that all of the recipes call for packaged gluten-free cake and brownie mixes like those from Betty Crocker and Gluten Free Pantry . Using the Betty Crocker Yellow Cake Mix, he and my wife made the Fresh Orange Bundt Cake drizzled with an orange juice glaze - it was amazing! Amazon.com has the book on sale for just $8.69, a 42% savings off the cover price. If you're looking for a fun parent-child activity for some upcoming school off-days, it may be worth a drive to Monmouth County, New Jersey, not too far off of Exit 8 of the New Jersey Turnpike. The Young Chefs Academy in Morganville is hosting allergy-free cooking workshops on January 17 (Gluten-Free National Candy Month) and February 21 (Gluten-Free Famous Dishes of the Presidents). There are other great-sounding workshops scheduled on Monday and Friday nights throughout the winter and spring seasons. With the holidays approaching, I'll be posting less frequently through the end of December. Look for my year-end roundup highlighting the many good finds from the past 12 months. Keep e-mailing all your great restaurant and product finds and upcoming events. You can also follow me on Twitter @gfphilly, where I tweet items of interest, sometimes before the information gets posted here. Thanks for joining me throughout 2010! I wish everyone a happy and healthy holiday season and a prosperous new year. The just-premiered second season of the Food Network series Cupcake Wars will have some local flavor this month, as one of the contestants will be Philadelphia's own gluten-free Sweet Freedom Bakery. On the prime-time competition, four cupcake bakers face off in three elimination challenges each week. At stake: $10,000 and the opportunity to showcase their cupcakes at a featured event. As part of the "Hard Rock" episode, premiering on Tuesday, December 28 at 9 p.m. Eastern, Alison Lubert (who co-owns Sweet Freedom with Heather Esposito) will battle three other cupcake bakers to have their creations on display at a Melissa Etheridge concert. Other contestants include Bruce Zipes of Bruce's Bakery (Brooklyn, N.Y.), Dorothy Tong of web-based Cupcake and Cookie (Los Angeles) and Christa Kelso of web-based Mini Baker (Los Angeles). The "Gluten-Free Holiday Giveaway Galore x10" announced last week continues through next Wednesday, December 15. As part of the giveaway, one entrant at this blog will win prizes that include a copy of Katie Chalmers' new gluten-free book for children and lots of food items. Just go to the original post and add your comment. Thanks to reader Murray K., who emailed me about Manna, a New American BYO in Margate (8409 Ventnor Avenue, 609-822-7722). The restaurant notes gluten-free items on its menu and also has several safe dessert choices. I've lived in the Philadelphia area all my life, but I'd never heard of Kemblesville until this week. It's in southern Chester County, and it's the home of Village Pizza and Subs (1765 New London Road, 610-255-0300), where you can get gluten-free pizza as well as linguini and ravioli. The kitchen uses separate equipment and ingredients for those items. Also in Chester County, Anthony's Wood Oven Pizza, located in Exton (410 West Lincoln Highway, 610-524-6666), serves gluten-free pizza. Extreme Pizza in downtown Wilmington (201 North Market Street, 302-384-8012) now offers Still Riding's gluten-free pizza. Check out the varieties there - choices like Ragin' Rooster, The Screamin' Tomato and Yard Sale! There are plenty of salads too. Big ups to reader Beth, who pens the Wheat Nothings blog, for first sharing this news. With advance notice, The Palm in Center City can prepare gluten-free crab cakes, bread and pasta. Le Castagne in Center City now offers brunch and early family-style dinner on Sundays from 10 a.m. to 3 p.m. Any menu item except the french toast can be made gluten free. Butterflies Healthy Food in Skippack is now JayBee's Cafe, still serving gluten free-friendly fare. Sweet Freedom Bakery has prepared a holiday menu that includes treats such as Mint Chocolate Cupcakes, Holiday Magic Bars and Triple Chocolate Crumb Cake. Orders are accepted through December 19. Redbridge beer and Strongbow cider can be had at Teri's on 9th at the Italian Market (1126 South 9th Street, 267-761-9154). Natural Harvest Market is new to Mullica Hill (45 South Main Street, 856-417-3812), and carries gluten-free products from Udi's, Mrs. Crimbles, Purely Elizabeth, Katz, Glutenfreeda, Conte's and more. ShopRite in Cherry Hill now stocks gluten-free products from French Meadow Bakery, including the pizza crusts, tortillas, brownies and brownie bites, chocolate chip cookie dough, breads, cupcakes and cakes. All of the bakery's products are made in a gluten-free facility. You can get get a dollar-off coupon at this link. Look for a special holiday-themed version of R.W. 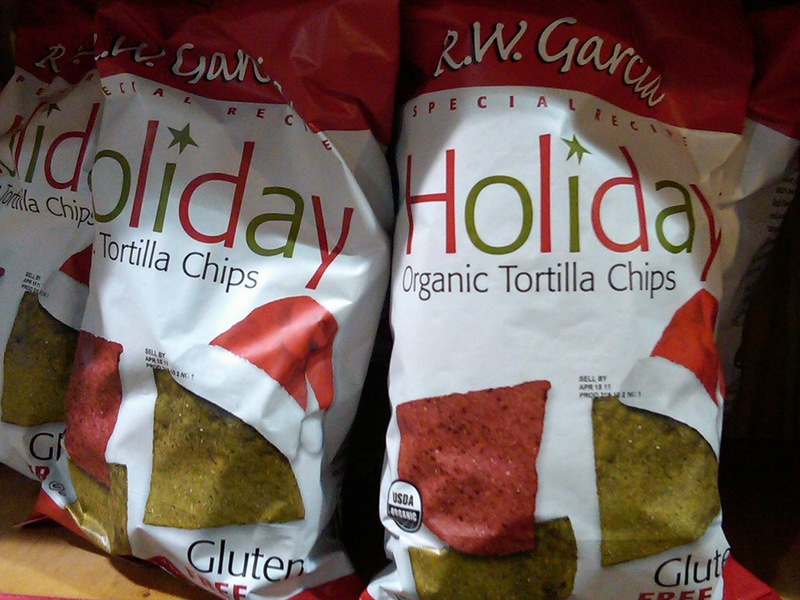 Garcia tortilla chips at Wegmans markets. I hardly ever pass up an opportunity to discuss baseball, so I'm happy to pass along a "save the date" for the 2011 Celiac Awareness Night at the Phillies. It will be held on Friday, July 8, when the Phils take on the Atlanta Braves. I'll post ticket and event information when it becomes available. This review was tough for me to write. Not because the gluten-free cookies from My Dad's Cookies weren't good - far from it. I struggled with it because I couldn't decide which variety deserved the most praise. Was it the mini Black & Whites, with their pillowy yellow-cake centers coated with vanilla and chocolate icings? Or the raspberry jam-filled Linzer cookies dusted with powdered sugar? The Chocolanos were a contender too - how could a facsimile of a Pepperidge Farm Milano cookie not be? Well, I still haven't reached a verdict. What I can say is that the sampling of sweets I recently tried from My Dad's Cookies were among the best gluten-free cookies I've ever had. 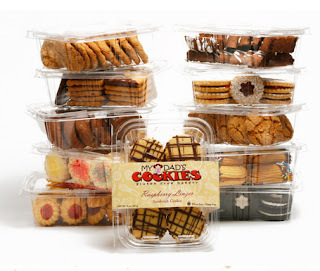 The product line also includes light and chewy chocolate chip biscotti, chocolate-dipped graham crackers, delightfully soft almond-flavored Italian cookies and seven other varieties. My Dad's Cookies come from the owners of Mozzarelli's Italian restaurant in New York City, which serves 18 different gluten-free pizzas and 14 gluten-free cakes. (Tiramisu, I hear you calling my name!) The daughter of one of the owners has celiac disease, and the cookies are produced in a separate area of the restaurant to avoid cross-contamination. The cookies, of course, are available at the restaurant, but you don't have to go to Manhattan to get your hands on them. Locally, they're sold at area McCaffrey's markets and Big Bear Natural Foods, Food For All in Mt. Airy, The Market of Lafayette Hill, Water to Go in Pennsauken, McFarlan's Market in Merchantville and Health Haven in Hainesport. The cookies can also be ordered online. DISCLOSURE: While My Dad's Cookies provided product samples for me to review at no cost, such compensation did not influence my review. Neither I am nor any immediate family member is an employee, officer, director or agent of My Dad's Cookies or its respective parent, subsidiary and affiliated entities, advertising and promotional agencies. Click here for my complete Disclosure. As I mentioned on Wednesday, I am one of 10 bloggers participating in the "Gluten-Free Holiday Giveaway Galore x10." As part of the giveaway, one lucky reader of this site will win prizes that include a copy of Katie Chalmers' new gluten-free book for children and lots of food items. You have until December 15 to enter; just go to the original post and add your comment. Last week, I mentioned that Carlucci's Grill in Yardley added a gluten-free menu. Well, I overlooked the fact that its sister location in West Windsor (335 Princeton-Hightstown Road, 609-936-0900) also added the same gluten-free menu with pizza and pasta, among other items. Harvest Seasonal Grill & Wine Bar in Glen Mills (549 Wilmington-West Chester Pike, 610-358-1005) serves gluten-free bread from Amaranth Bakery. The long-in-the-making Agiato in Manayunk (4359 Main Street, 215-482-9700) has finally opened, according to the Inquirer's Michael Klein. The restaurant participates in the NFCA's GREAT restaurant program. New reader Todd C. emailed me about Manayunk's The Ugly Moose (443 Shurs Lane, 215-482-2739), which can accommodate a gluten-free diet. Also available there are Redbridge, New Grist and Shakparo beers. Midatlantic in University City (3711 Market Street, 215-386-3711) can serve gluten-free diners and, in addition, offers Samuel Smith Organic Cider and a rotating gluten-free beer selection. Outback Steakhouse, Bonefish Grill, Carrabba's Italian Grill and Fleming's Prime Steakhouse & Wine Bar are offering a holiday gift card deal. Buyers will receive a $20 Bonus Card for every $100 purchase of gift cards. The gift cards and Bonus Card can be used at any of those restaurants; the Bonus Card is valid from January 1, 2011 to February 10, 2011. The Grain Exchange's products are now not only gluten free, but also nut free. In addition, the bakery will be producing biscotti - starting with chocolate chip - using Mr. Ritt's recipe. Caramel delight bars and several cookie varieties from The Grain Exchange are now available at BRE Bakery, located at the new 263 Marketplace in Warminster (700 York Road, 215-821-8462). Thanks to reader Marcella P. for the tip. Main Line Baking Company in Wynnewood will offer online ordering and nationwide shipping of its gluten-free items starting December 13, and is working on developing some vegan/gluten-free baked goods. Udi's awesome breads and bagels are now carried by Trader Joe's markets in the area for $4.99 a package. Back in June, I mentioned that a local company had introduced gluten-free New England Clam Chowder and Southwestern Clam & Corn Chowder under the label of Old Original Bookbinder's, the famed Philadelphia seafood restaurant. 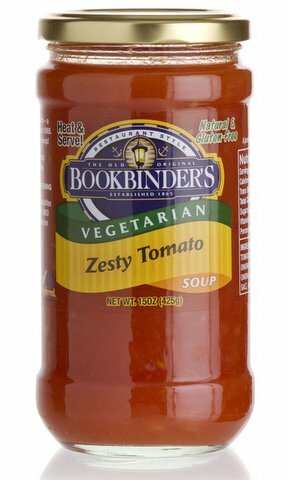 New to the product line are ready-to-serve vegetable soups in four flavors: Brandywine Mushroom, Butternut Squash and Mushroom, Sweet Burgundy Onion and Zesty Tomato. They will be sold in natural and specialty food stores across the country. This month's Amazon Grocery sale items are posted, and there are a few gluten-free products listed. Add an additional 15% savings when combining the instant rebates with a Subscribe & Save order. Reader Jackie P. let me know that St. Peter's School in Queen Village (319 Lombard Street), is holding a Holiday Sale this weekend that will include a selection of gluten-free baked goods. The sale will run from 10 a.m. to 4 p.m. on Saturday and 11 a.m. to 2 p.m. on Sunday. The Big Blue Marble Bookstore in Mt. Airy will host a book launch party on Sunday, December 12 for Genevieve Sherrow, a nutritionist, food writer and natural foods chef based in South Philadelphia. She will discuss her new self-published book, Gluten-free Warrior, a therapeutic whole foods cookbook for individuals with gluten, wheat and soy allergies. The book includes a collection of recipes inspired by Indian, East Asian and contemporary American cuisines. Food from the book will be available for sampling at the event, which begins at 2 p.m. Finally, a reminder that the next Philadelphia Gluten-Free Supper Club dinner is scheduled for Tuesday, December 14 at Buca di Beppo in Center City. For more information about the club or plans for the dinner, e-mail reader Adriana Z.
Katie Chalmers’ new children's book, Mommy, What Is Celiac Disease, grew out of personal experience: she was diagnosed with the disease in 2007 and, after having her children tested, discovered that her daughter Morgan has it too. Katie's book, which is neatly illustrated with drawings atop colorful photographs, relates a conversation between a mother and her young daughter who learns that she has celiac disease. In the exchange, the little girl understands that while her diet will be changing, her youthful enthusiasm will not be diminished. The book is available locally at Wegmans for a discounted price of $11.16 and is being carried in the Nature’s Marketplace area of the stores. For more information about the book and to view sample pages, visit Katie's website (the book can be purchased there as well); you can also "like" her on Facebook and follow her on Twitter. A signed copy of Mommy, What is Celiac Disease? To enter, leave a comment to this post about the best gluten-free grocery item you discovered in 2010. Make sure your comment provides a way for you to be contacted. If your comment does not link back to an email address, blog or website through which I can get in touch with you (some past entrants have blocked their Blogger profiles), post your email address in the comment in the following format: "name[at]domain[dot]suffix." All 10 giveaways are open to residents of the United States. The Accustomed Chaos and Gluten Free Easily giveaways are also open to Canadian residents. The entry period begins on Wednesday, December 1, 2010 and ends on Wednesday, December 15, 2010 at 10 p.m. EST. Entry requirements will vary between bloggers. Please follow the site-specific directions to enter. Entrants can only win once total within all 10 giveaways. If anyone is chosen more than once as a winner, another winner will be chosen so everyone only wins once. Winners with valid entries will be selected at random. The winners will be announced and notified via email and must reply within 24 hours to claim. Otherwise, another eligible entry will be chosen, in order that all prizes will arrive before Christmas. So please remember to check your email on Thursday, December 16. If any of the 10 prizes do not arrive before Christmas because of any unforeseen holiday mail rush problems, the United States Postal Service, Katie Chalmers and hosting bloggers will not be held accountable. DISCLOSURE: Katie Chalmers has provided me with a review copy of the book and is offering the prize pack. Neither I am nor any immediate family member is an employee, officer, director or agent of hers or affiliated entities, advertising and promotional agencies. My full Disclosure Policy can be found at the blog's Disclosure page.